There's lots of advice online about how to grow an avocado seed. I've tried every method in different combinations with varying degrees of disappointment. 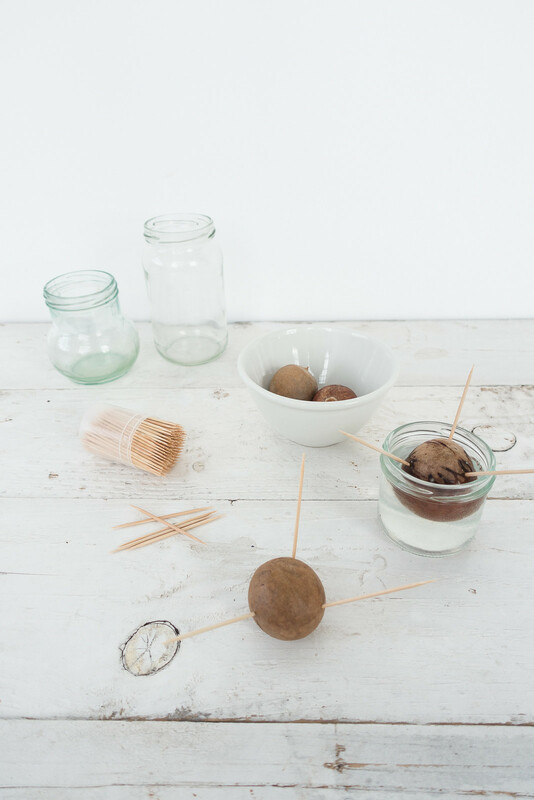 Avocado seeds are temperamental; it might take a few tries to get one to sprout or you might get lucky first try. 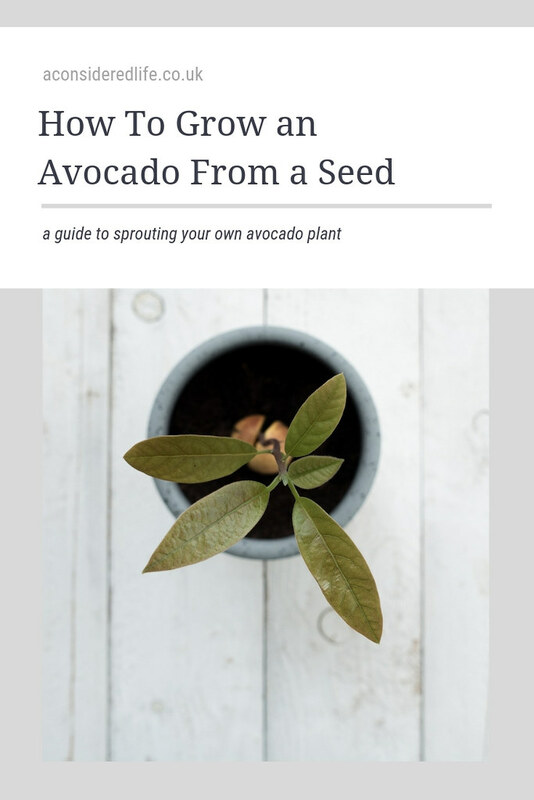 You might find you follow the most commonly known methods for growing an avocado plant and see great success or, like me, struggle for years to get a single seed to crack let alone sprout. This is my method, which works so well every seed I plant grows! There's a couple of things worth mentioning before attempting to grow an avocado plant. Grow a few seeds at once to increase your chances of success; some seeds never grow, some takes months and others like to sprout straight away. You never know what you're going to get until you put it in water and wait.. and wait.. and wait. Growing an avocado plant takes a lot of patience. 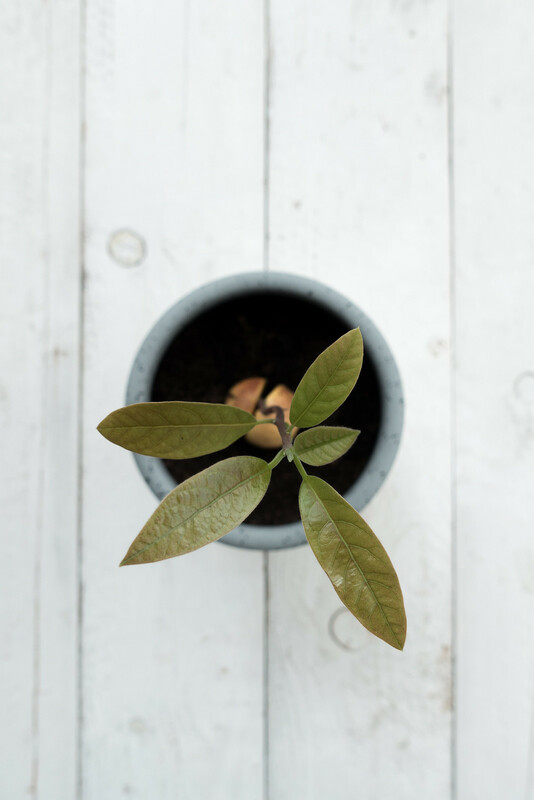 Be prepared for a long waiting game; even if your sprout cracks and starts to sprout within weeks, it will still take months for the roots to grow and sprout to develop enough for it to be considered a plant. It's tedious and tense but once you start to see real growth your hard work of doing nothing starts to pay off in excitement. · a lot of patience! Step One: Remove the seed from the fruit being careful not to damage it. I find scooping it out with a spoon or squeezing the fruit until the seed pops out is better than trying to cut around it and risk causing damage. Step Two: Wash your avocado seed using warm water to remove any remnants of the fruit. I've seen people recommend peeling off the brown outer layer on the seed. I say, don't bother. You risk damaging the seed and it'll grow just fine with it on there; it'll start to peel off on its own as the seed grows. Step Three: Hold the seed with the pointed side up and insert 3 or 4 toothpicks at a slight downward angle. This creates a structure that will hold the seed in place, half submerged in water. Step Four: Wash, clean, and fill a glass jar with slightly warmer than lukewarm water. The water shouldn't be hot but it should feel warm to the touch. In my experimenting, I've found this works the best especially in the colder months when it takes longer for the sun to warm it. When choosing a jar, opt for a tall one if possible; this will give your seed the space it needs for its roots to grow downwards. You can use short, stumpy jars if that's all you've got but be prepared for planting to be a little trickier as the roots will twist as they grow. Step Five: Balance the seed over the lip of the glass jar. The seed should sit half in and half out of the water. Step Six: Place the jar in a warm place. You might want to try various spots in your home to figure out the best place for them, and be mindful that conditions will change depending on the season. I place mine on a windowsill that gets direct (but not glaring) sunlight in winter, and move them out of direct sunlight in summer. Step Seven: Keep an eye on the water level and top it up. 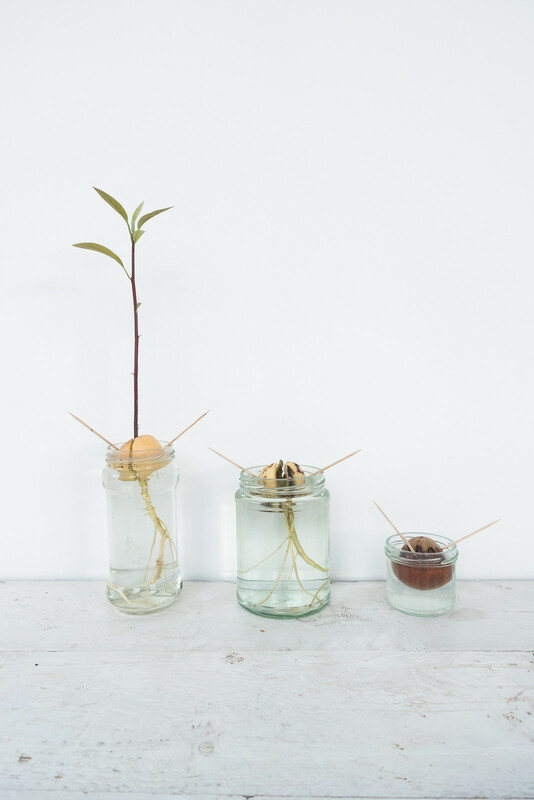 This is the most important step in growing an avocado plant: the seed must always be sitting in water. If the seed (especially the roots) ever dries out, it will die. I suggest making sure the water always covers half of the seed. Step Eight: Every 5-7 days replace the water. You might notice the water turning green and you might find light algae growing on the seed itself. This won’t cause damage to the plant and trying to clean the water or seed itself is more likely to damage it than leaving the algae to grow. When the seed is more established, you can wash this algae off - just be careful as the seed can easily fall apart once it's fully cracked. Step Nine: Wait for 2-6 weeks. You should see the brown outer layer start to split and then the seed itself will start cracking. A taproot will start growing followed by a sprout from the top. If you don’t see any growth after 6-8 weeks, try another seed. 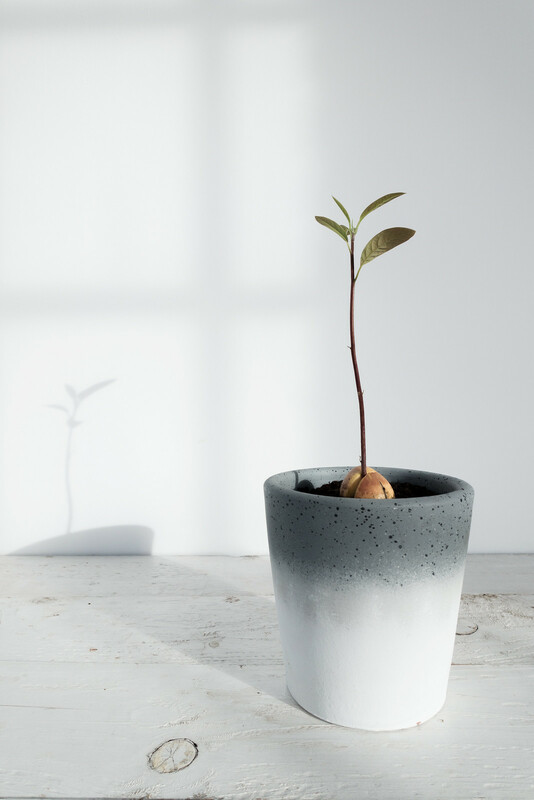 There are two ways you can handle a growing seed: plant it in soil when a large taproot or roots have grown and a sprout is starting to develop or leave it in the glass jar until it's grown around 6-8 inches tall. Planting a seed up has its risks; you'll need to make sure you don't damage the roots as you surround it with soil but the payoff is faster growth. Leaving it to grow in water will mean glacial growth but you'll avoid the risk of damaging the seed when you pot it up. Either way you'll still have a long wait before it's an established plant. When you pot up your avocado plant, do so in humus soil in an 8-10 inch diameter pot leaving the top half of the seed exposed. Avocado plants love the sun so find it a bright spot to live in out of direct sunlight that could scorch the leaves. Give it frequent waterings; the soil should always be damp but never saturated. Watch out for yellowing leaves, which is a sign of overwatering. Most people who kill their plants do so from too much love. If in doubt, don't water; check the soil by feeling an inch into the top layer and checking the drainage hole in the bottom of the pot. If the soil is dry to the touch, give your plant some water. Avocado trees are spindly things unless you prune them to encourage growth. You can pinch out the top leaves to promote side shoots and more leaves to branch out making the plant bushy. You can keep doing this every time the plant grows another 6 inches. Or you can leave it and let it do it's own thing! Let me know how you get on with growing your own avocado plant!